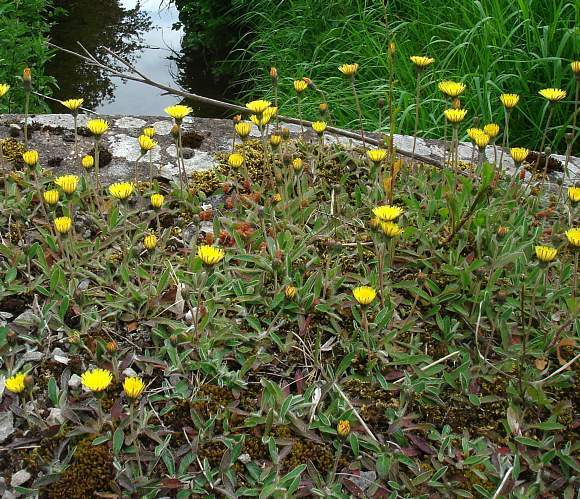 Mouse-ear-hawkweed is not a Hawkweed (species of Hieracium) but rather a Pilosella species of which there are only a few in the UK. 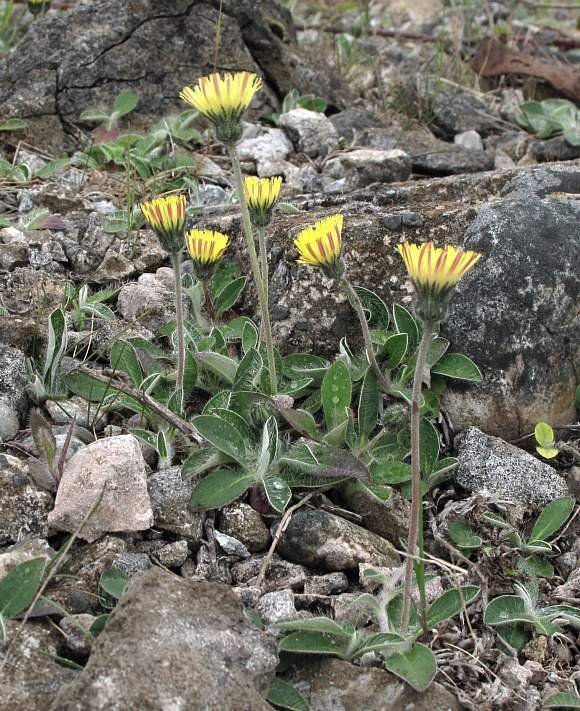 It grows on rocks and stones (as here on a gravelly ex-railway) or short grasslands on well-drained soils. 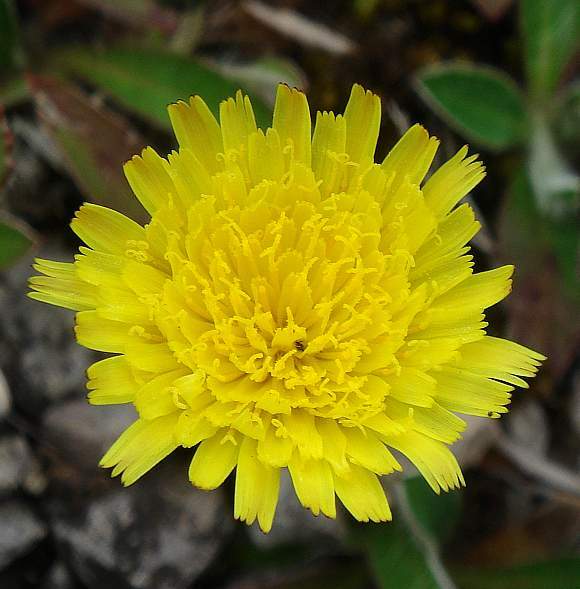 A single leafless stalk bears a single yellow flower. 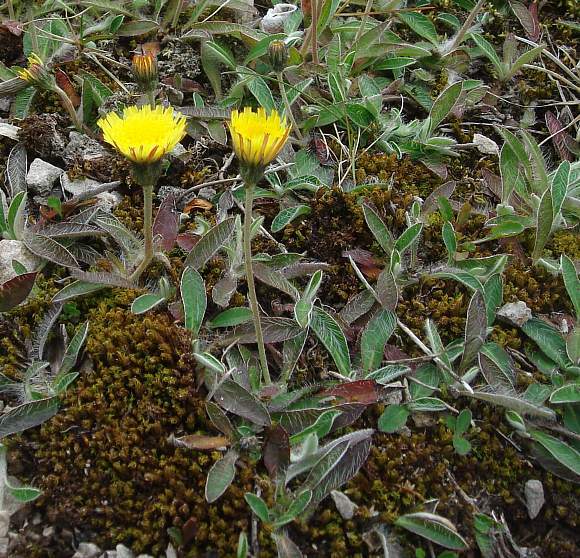 The flower stalks are un-branched, leafles and up to 30cm tall (max 50cm). Leaves have a silvery edge, with long hairs on the upper mid-green surface but whitish with hairs on the underside. 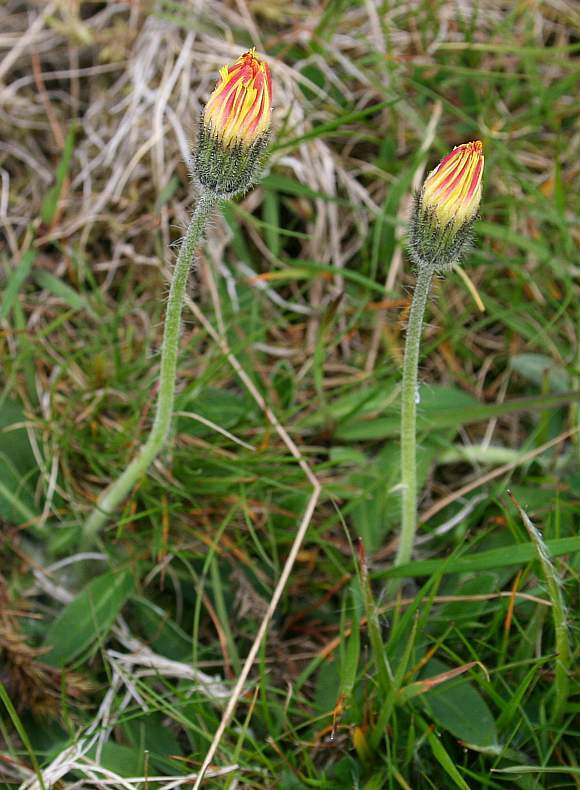 They are oblanceolate (wider nearer the far end and narrowing towards the flower stalk and are stalkless). 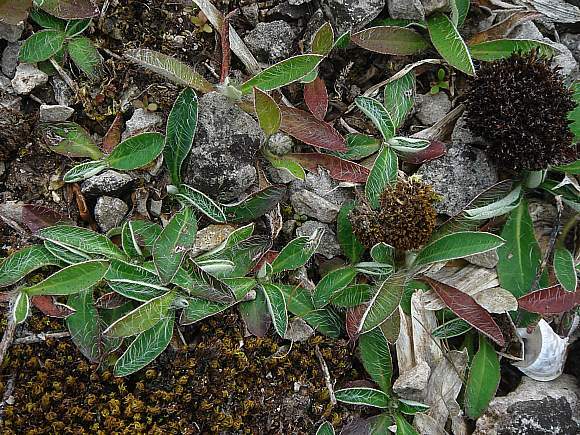 There are more basal rosettes than there are flower stalks, they spread by rooting another smaller basal rosette nearby. 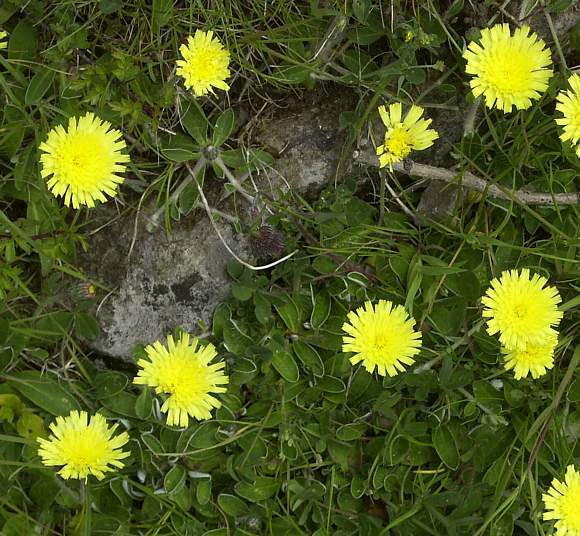 The flowers have a fairly wide cup and dandelion-type flowers which are a paler yellow than Dandelions. Often the outer parts of the outer ray florets are tinged a pale red, but not always. Specimens A. 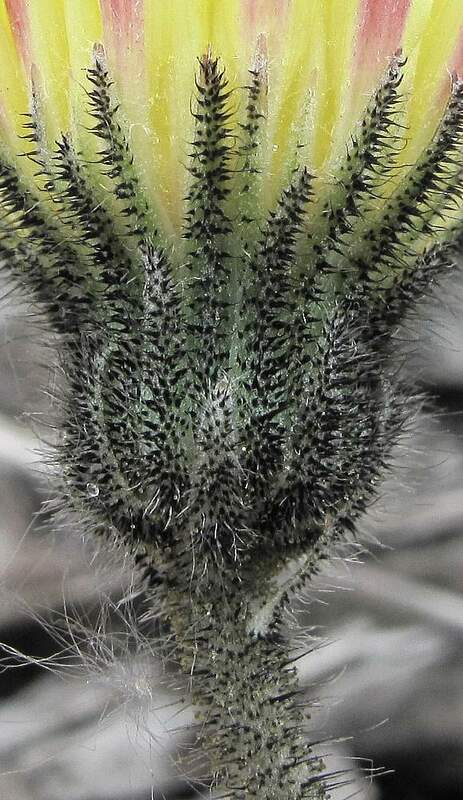 Black and long stem hairs and shorter hairs on sepals, neither glandular on this specimen. Long white hairs on leaves. The upper stems of these specimens are covered in ants. Here only the tips of the outer ray florets are tinged pale-red. Specimens A. 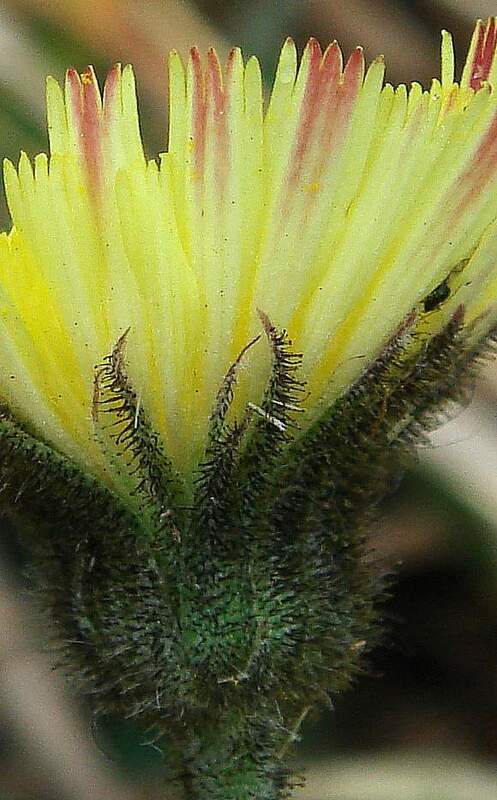 Black and long stem hairs and shorter hairs on sepals, neither are glandular on this specimen. Specimens A. The basal leaves. 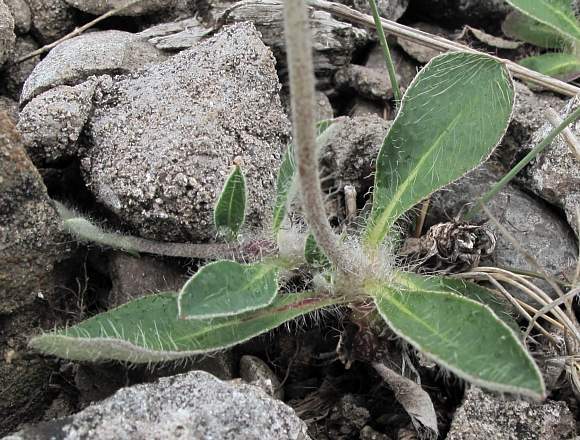 No Mouse-ear Hawkweed has leaves on the stems. 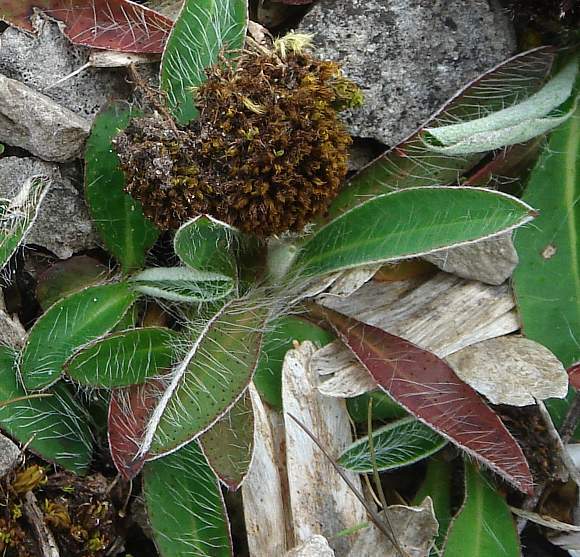 The lower stems may have long thin white hairs (rather than perhaps black above), as do the leaves. 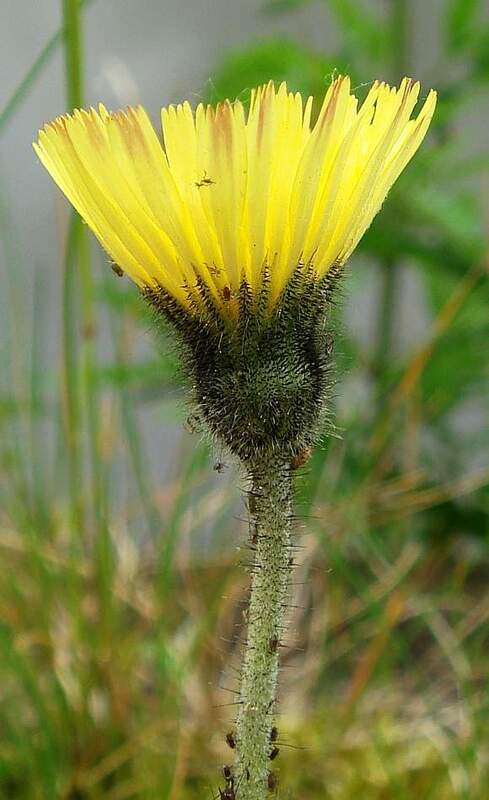 The long white hairs on the leaves may come from a tiny blackish pimple. A birds-eye view of the lemon-yellow flowers. The un-opened flowers are much redder - three are visible here. It looks like these specimens are extending trial runners with leaves attached to perhaps become basal rosettes a bit further (if there was any Earth there for them to take root!). The end of the ray florets is square with 4 cuts (making 5 florets per ray floret). The florets in the centre have 2 concolorous yellow stigmas atop a style. 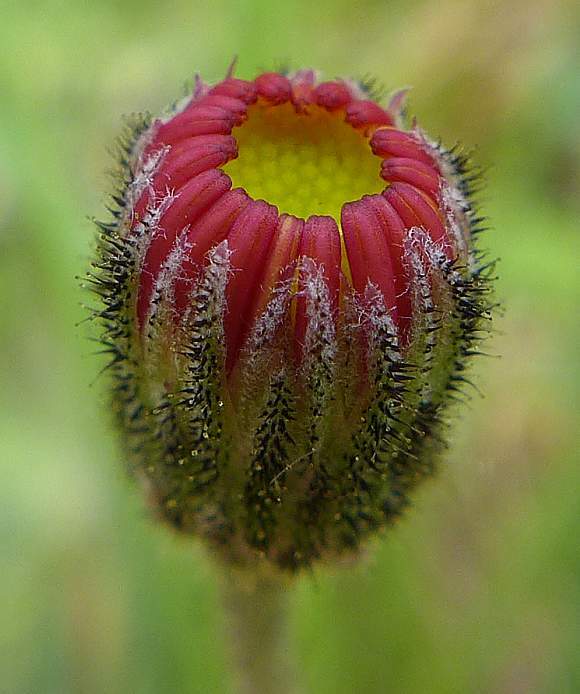 An un-opened flower bud - they look a little like unopened flowers of Orange Hawkweed (Polosella aurantiaca) at this stage, having deep-red outer florets. The shorter disc florets are all huddled inside. There are two rings of narrow sepal teeth cupping the flower, a shorter outer set and a longer inner set. The exact appearance of the hairs on the sepal teeth is variable. There are usually black, but whether they have tiny spherical glands at the ends or not is variable. So too is whether they have conical bases or not. This specimen has both spherical glands at the tip and conical bases. The hairs sometimes split into two or three near the ends (stellate hairs). This specimen has both spherical glands at the tip and conical bases. The hairs sometimes split into two or three near the ends (stellate hairs) [just left of dead-centre]. Black hairs on the sepal teeth: This specimen lacks the globular glands at the ends, but does have conical bases. The hairs have longer white extensions further down, with some being very long indeed. Flowers just a short time before opening fully. Leaves with long white hairs. A typical basal leaf with either 3 or 6 leaves. 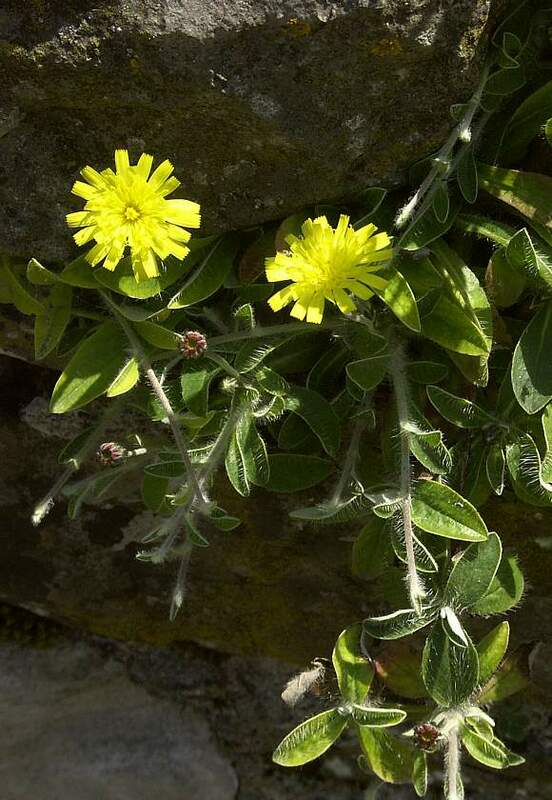 The leaves are stalkless and winged where they taper to the flower stem. Leaves white beneath with short matted hairs and shaped like the ears of mice, hence the name of the plant. 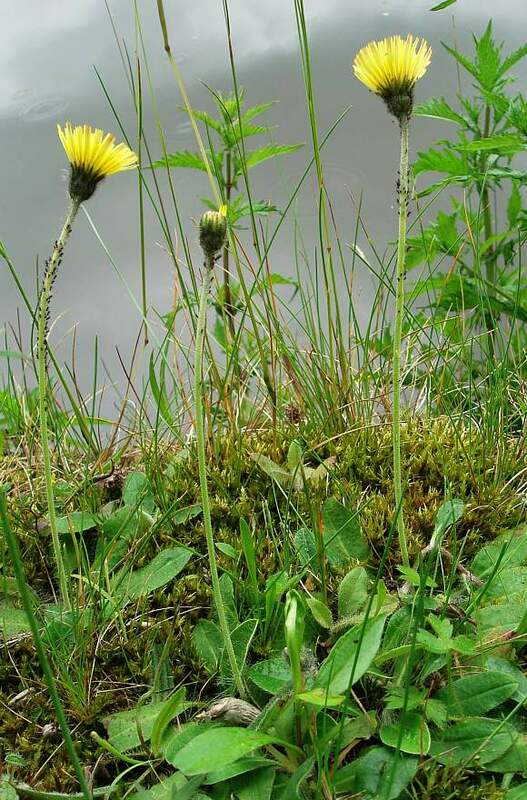 Mouse-ear Hawkweed exists as seven species / hybrids which Clive Stace thinks should be better described as being just varieties rather than hybrids or sub-species. These differ in several features making the features in the above photos differ from each other, in the way the hairs are black or white, simple or glandular, with splits in the ends (stellate hairs) or not and variations in their length. Also in the reddish colouring of some petals, or not and whether the stolons are stout or slender and long or short, the flower stems leafy or not and the size of the flower. 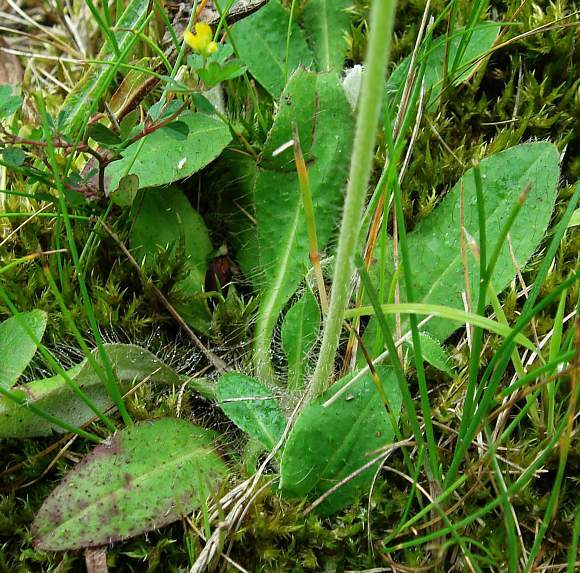 Thus varieties called Spreading Mouse-ear-hawkweed , Tall Mouse-ear-hawkweed and the [RRR] rare Shetland Mouse-ear-hawkweed are encompassed in these 7 variations. Some of these variations also occur more often in certain places in the UK, but apart from the rare Shetland variation can also be mixed in with other populations. The above photographs, because their characteristics vary between themselves, will be several of these 7 varieties (except for the rare Shetland one which is found only in Shetland). Distinguishing Feature : The long hairs on the basal leaves which are shaped like the ears of mice.